If you pull up a satellite picture of Plainview on Google Maps, the first thing you’re likely to notice is that the Texas Panhandle city of 22,000 is surrounded by hundreds of perfect green circles – telltale evidence of farmers irrigating their crops with high-efficiency center-pivot sprinklers. Someday soon – within a few decades at most – many of those sprinklers will likely be gone, rendered useless by rapidly dropping water levels in the Ogallala Aquifer, according to a new study from the University of Texas at Austin. Farmers throughout the southern High Plains may follow suit after more than a half-century of drawing water from the ground far faster than it can be replenished, says Bridget Scanlon, a senior scientist at UT’s Bureau of Economic Geology and lead author of the paper published in May in the Proceedings of the National Academy of Sciences. Coupled with the prospect of torrid summertime temperatures due to accelerating climate change, this will in time force many farmers to turn toward dryland agriculture with such drought-tolerant crops as cotton and sorghum, Scanlon predicts. The paper, co-authored with scientists from the U.S. Geological Survey and University of Rennes in France, drew on information collected from thousands of monitoring wells as well as regional data collected from twin satellites operated by the Gravity Recovery and Climate Experiment (GRACE). Despite the grim news for Texas farmers, the researchers found considerable variation throughout the Ogallala, which lies beneath most of Nebraska and parts of South Dakota and Wyoming in the north, and runs south through western Kansas, eastern Colorado and New Mexico and the Oklahoma and Texas panhandles. In Nebraska the aquifer has fallen no more than a foot on average in the 60 years since scientists started measuring water levels, according to the study. But in parts of west Texas, the water has dropped by more than 30 meters – around 100 feet – over the same period. In fact, about a third of the total depletion has occurred in just 4 percent of the High Plains aquifer – mainly in Kansas and Texas. Puzzled by the differences, the researchers examined several variables. Precipitation was an obvious candidate, but snow and rainfall levels follow roughly similar contours running north to south, Scanlon says. Mechanical irrigation spread in Texas in the 1950s, earlier than in Nebraska, but water demand throughout the region has since more or less averaged out, she says. That left one major factor: groundwater recharge – the rate at which rain, snow and surface water percolate back down through the ground to replenish the aquifer. “We show that the recharge in Nebraska is much higher,” Scanlon says. “Most of the recharge in Kansas and Texas occurred during the last glacial period,” about 13,000 years ago. Nebraskans benefit from sandier soils, which promote percolation. They also receive supplemental irrigation from the Platte River, whose return flow seeps into the ground. Many farmers in Kansas and Texas, meanwhile, contend with fine-grained soils that don’t allow water to penetrate very deeply, Scanlon says. Those tightly packed soils tend to work against those who are more frugal in their irrigating practices. South of Lubbock, about 40 percent of the crops are irrigated and 60 percent are already dryland, says Jackie Smith, a professor and extension economist in the Texas A&M University Agricultural Economics Department. Cotton predominates, with corn becoming part of the mix north of Plainview (which is about 50 miles north of Lubbock) and extending into the northern Panhandle, he says. A regional shift away from irrigation has occurred before. In the 1980s, skyrocketing fuel prices hit West Texas farmers who relied on the water- and labor-intensive irrigation systems common at the time, Smith says. “For a lot of them, it was more profitable to go to dryland farming then,” he says. A decline in irrigation is bound to have a profound economic impact, Smith says. Farmers would earn less from their crops due to lower yields, land values would drop and farms would likely grow larger as owners sell out and properties are consolidated – yet they would support fewer people. 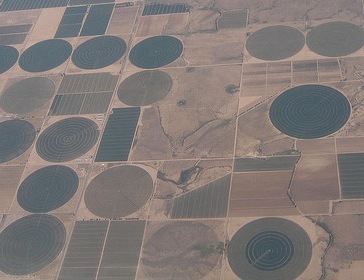 Scanlon and her colleagues compared the High Plains – the nation’s “grain basket” – with California’s Central Valley, often called the “fruit and vegetable basket.” Much of the Central Valley is a desert climate, where farmers mainly irrigate with water flowing through canals and aqueducts from the Sierra Nevada mountain range (supplementing it with groundwater during drought conditions). California’s farmers are drawing down their aquifer at a rate of about 1.2 inches a year, according to a paper published last year in Geophysical Research Letters. A team led by Jay Famiglietti, director of the Center for Hydrologic Modeling at the University of California, Irvine, estimated that between October 2003 and March 2010 the Central Valley lost an estimated 20.3 cubic kilometers of water – about two-thirds the volume of Lake Mead, the nation’s largest reservoir in maximum water capacity, located southeast of Las Vegas. The prospect of more frequent droughts driven by human-caused climate change won’t help matters, Scanlon says. “We really didn’t get into climate change issues in the article, but a lot of people talk about the increasing intensity of the water cycle, so we might see more climate extremes in the future,” she says. A predicted increase in average summertime high temperatures “is going to be an issue,” she adds, pointing out that hotter days boost the rate at which water evaporates out of the soil, creating a vicious cycle in which ever more water is needed to keep plants green. On the other hand, some climate models predict that hotter temperatures and prolonged drought in the Southwest will be accompanied by occasional episodes of torrential rainfall. “If you get more intense rains, you might have a better chance at (groundwater) recharge, actually,” Scanlon says. The bottom line, she says, is that over time the climate and hydrological trends are more likely to benefit Nebraskans than Texans. “Whether Texans believe in it or not,” climate change is projected to bring warmer, drier conditions to southern areas and wetter weather to the north, so agriculture now in the Texas Panhandle may “shift northward,” Scanlon says. Michael Haederle is a New Mexico-based writer. He previously wrote about Lubbock’s search for a sustainable water supply for Texas Climate News. Haederle has contributed to Miller-McCune, AARP Bulletin, the Los Angeles Times, People, Tricycle: The Buddhist Review, The Houston Post, Dallas Morning News and many other publications.